Our staff is our major asset. No matter how unusual or difficult the assignment, we meet each challenge confidently with a dynamic, award winning team of landscape experts unrivaled in our area. Twin Resources professionals consistently apply the MIH attitude (our slogan: Make It Happen). 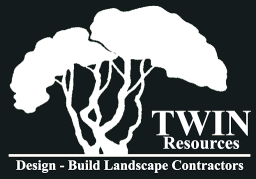 Through all stages of planning and design, Twin specialists consider every aspect of client’s needs, because we have such a thorough command of our field. Final proposals reflect an originality that only we can deliver. Our crews are comprised of thoroughly trained employees with years of experience in the landscaping and horticultural field. Each crew is supervised, assuring the highest degree of productivity and immediate on site responsiveness to any problem. At all times, clients are kept updated on the various stages of progress. Twin provides maximum crew support by maintaining an extensive inventory of equipment. To assure the best quality of landscaping materials, we purchase large quantities of trees and shrubs from the finest growers in the country. This guarantees immediate availability as well as the ability to fulfill even the largest landscaping project requirements promptly. From concept to completion, Twin professionals regularly amaze their clients with their originality and tireless dedication to their craft. Their hours are the hours of perfectionists, and the quality is clearly evident in their work.